Provides an introduction and overview for the Algebra Review - Basic Algebraic Skills course. Introduces the content, why it is important, and where it can be used. 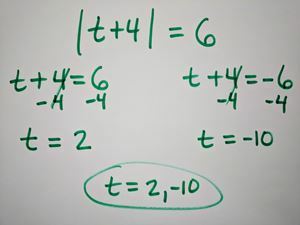 This is a quick review on how to combine like terms and reminds how to add and subract integers. Includes adding constants that can be integers, rational numbers, irrational numbers and more. And combines terms with like variables. Presents the answers to the Combining Like Terms Lesson Homework by demonstrating how to solve homework problems. Reviews the order of operations. 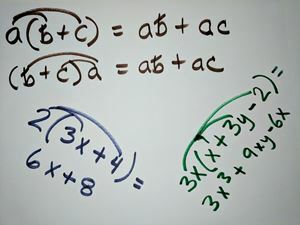 Solving a numberical or algebraic expression can have different results if the order of operations is not followed. 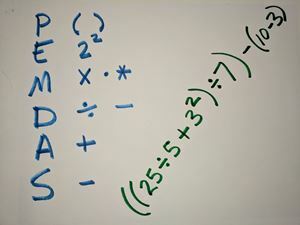 The order must follow PEMDAS which stands for parenthesis, exponenents, multiplication, division, addition, then finally subtraction. Presents the answers to the Order of Operations Lesson Homework by demonstrating how to solve homework problems. Reviews how to evaluate algebraic expressions by plugging in given values for the variables. Care must be taken to keep track of negative signs and to follow the order of operations. 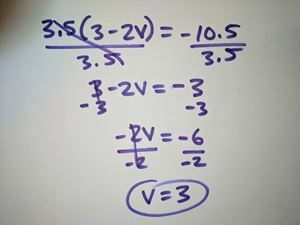 This skill of plugging in numbers and evaluating to get an answer is critical for utilizing formulas in finance classes, science classes such as physics and chemistry, and more. Presents the answers to the Evaluating Algebraic Expressions Lesson Homework by demonstrating how to solve homework problems. Simplify exponential expressions including zero exponents, negative exponents, multiplying and dividing when two variables have same base. 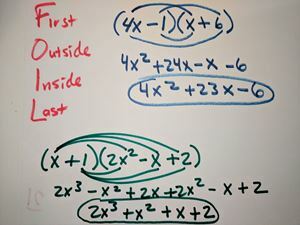 Presents the answers to the Simplifying Exponential Expressions Lesson Homework by demonstrating how to solve homework problems. 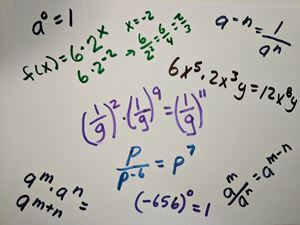 Reviews the distributive property used to mulitiply across algebraic expressions. Presents the answers to the Distributive Property Lesson Homework by demonstrating how to solve homework problems. 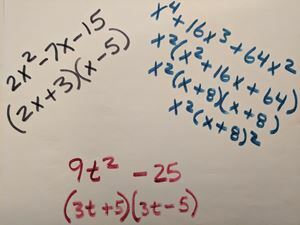 Review distributive property by extending to multiplying two binomial expressions using the FOIL method. Foil stands for first, outside, inside, and last. 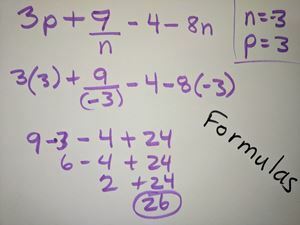 Show how to also use the distributive property to multiply a binomial and a trinomial. Presents the answers to the Multiplying Binomial Expressions and FOIL Lesson Homework by demonstrating how to solve homework problems. Reviews factoring of algebraic expressions. Includes factoring special cases. This lesson has 2 homework sheets and will take longer to complete than those with a single homework sheet. Presents the answers to the Factoring Lesson Homework Part 1 by demonstrating how to solve homework problems. Presents the answers to the Factoring Lesson Homework Part 2 by demonstrating how to solve homework problems. Reviews how to translate word phrases into algebraic variable expressions. Includes arranging addition, subtraction, multiplication, division, fractional parts, and exponents. Presents the answers to the Writing Variable Expressions Lesson Homework by demonstrating how to solve homework problems. Reviews how to solve algebraic expressions to find the value of the variable. Includes integer and decimal coefficients and a trick to solving proportions quickly. This lesson has 3 homework sheets and will take longer to complete than those with a single homework sheet. 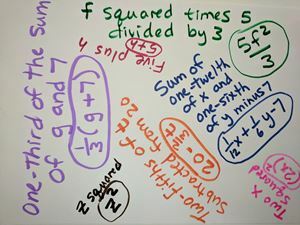 Presents the answers to the Solving Algebraic Equations Lesson Homework Part 1 by demonstrating how to solve homework problems. Presents the answers to the Solving Algebraic Equations Lesson Homework Part 2 by demonstrating how to solve homework problems. 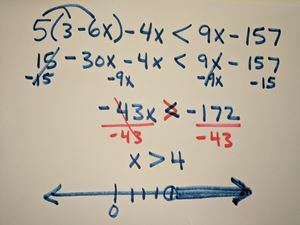 Presents the answers to the Solving Algebraic Equations Lesson Homework Part 3 by demonstrating how to solve homework problems. Review solving of algebraic equations involving inequalities and graph on the number line. Presents the answers to the Solving Inequalities Homework Part 1 by demonstrating how to solve homework problems. Presents the answers to the Solving Inequalities Lesson Homework Part 2 by demonstrating how to solve homework problems. Reviews absolute value and solving of algebraic equations involving absolute value. Presents the answers to the Absolute Value Lesson Homework by demonstrating how to solve homework problems. 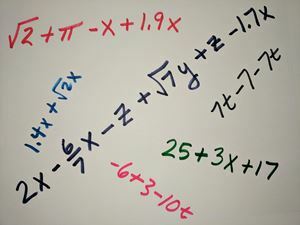 This module provides a review of basic algebraic skills needed to be successful in advanced algebra or any other course that requires algebra as a pre-requisite. Includes a review of the following skills: combining like terms, order of operations, evaluating algebraic expressions, simplifying exponential expressions, distributive property, multiplying binonomial expressions and FOIL, factoring, writing variable expressions, solving algebraic expressions, solving inequalities, and absolute value. Intended to review and strengthen basic Algebra skills needed for courses taken after successful completion of Algebra. 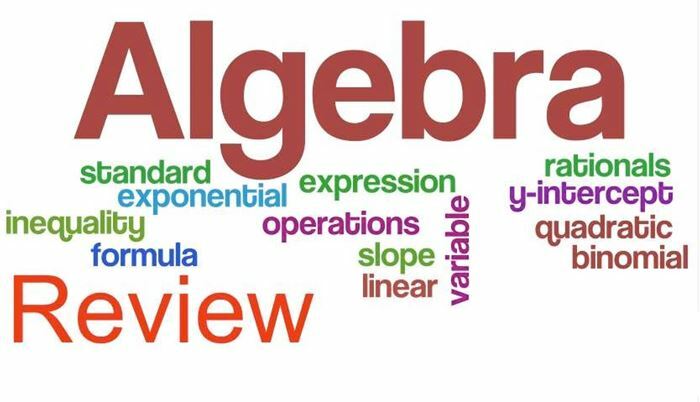 This course is intended for student that have completed an Algebra course, as a review of Algebra, and is recommended for any student preparing to take any course that requires Algebra as a pre-requisite, such as Geometry, or Advanced Algebra students such as Math for 10th Grade. Also valuable for Finance, Statistics, Chemistry, Physics. Can also be taken at anytime during a course when the need for review of basic Algebra is observed. Successful completion of Algebra course. Interests: Math application in the real world. Issues I care about: Using creative and varied ways to make challenging subject understable to everyone. Everyone should have the opportunity to learn challenging subjects. It is my job to make it understandable. Answers to the quizzes that are part of the homework answers lessons. Provides the answers to the homework worksheet for Combining Like Terms. Provides the answers to the homework worksheet for Order of Operations. Provides the answers to the homework worksheet for Evaluating Algebraic Expressions. Provides the answers to the homework worksheet for Simplifying Exponential Expressions. Provides the answers to the homework worksheet for Distributive Property. Provides the answers to the homework worksheet for Multiplying Binomial Expressions and FOIL. Provides the answers to the homework worksheet for Factoring. Provides the answers to the homework worksheet for Writing Variable Expressions. Provides the answers to the homework worksheet for Solving Algebraic Equations. Provides the answers to the homework worksheet for Solving Inequalities. Provides the answers to the homework worksheet for Absolute Value.